A break from motion graphics and back to graphic design for Sinfini Music. 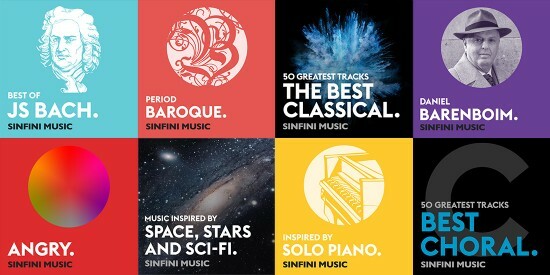 Sinfini Music, a branch of Universal Records, specialise in classical music with a fresher approach to appeal to a younger audience. They have a series of playlists on Apple Music and Spotify and approached me to design an identity to reflect a series of moods, composers, days of the week, artists…. anything that takes their fancy! There could be many, many playlists so it was important that the design could be template’d and taken in-house for additions to each series. Flexibility to accommodate varying title lengths but also look like they are compiled by Sinfini Music was required. Each series has it’s own look and feel while keeping to the Sinfini Music style guide, easily identified by typography, layout, colour and style of chosen image.